CNEWA’s Parish Outreach program has been keeping us busy recently, and this past weekend was no different. I had the pleasure of traveling with my colleagues Norma Intriago and Deacon Greg Kandra to St. John the Evangelist Church in Altoona, PA. The pastor, Msgr. Michael Becker, a longtime friend of CNEWA, invited us to visit and share the agency’s work in the Middle East. After a ride over the George Washington Bridge and into the fall foliage-covered mountains of Pennsylvania, we arrived at St. John’s for the three weekend Masses, at which Deacon Greg served and preached. His homily focused on the work of the incredible sisters CNEWA is blessed to partner with, and he shared the stories of their work with Christians in the Middle East. He also mentioned that every gift we received that weekend — and until All Saints’ Day — would be doubled, thanks to the wonderful matching gift we received a few weeks ago from a generous donor in California. The CNEWA table in the vestibule also proved to be quite popular before and after each Mass. Parishioners came by to learn more about our work and sign up for a subscription to ONE Magazine. The parish also graciously put out a collection box for us. Msgr. Michael Becker, pastor, pauses between Masses with Norma Intriago, CNEWA’s Development Director, Deacon Greg Kandra and Chris Kennedy, Development Associate. We also had the opportunity to speak to the faith formation classes between the Sunday Masses. Norma and I met with the adult faith formation class (and sampled some delicious pumpkin streusel!) while Deacon Greg spoke to the middle and high school students. In addition to answering questions about the current situation in the Middle East, we shared stories about our work in Ethiopia, where Msgr. Becker and Norma had visited on a CNEWA-sponsored trip in 2009. It was a wonderful weekend, and a great chance to meet so many generous, caring people. Most notably, it was gratifying to talk to people who had heard of the plight of Christians in the Middle East, and weren’t sure how to help them — until now. Finally, before we got back on the road to New York, we presented Msgr. Becker with a piece of artwork done by a student at the Pontifical Mission Summer Bible Camp in Zerqa, Jordan. Over 350 Iraqi Christian refugees and Jordanians attended the camp, sponsored by CNEWA and staffed by the Franciscan Missionaries of Mary. Msgr. Becker shows off his unique piece of artwork, created by a student in Jordan. We’re always looking for new parishes to visit and spread our message. If you and your parish are interested in having us, simply contact Norma Intriago at nintriago@cnewa.org. An Egyptian boy plays with a toy camera he found in the garbage. Cairo’s “Zabbaleen,” or “garbage people” earn a meager living hauling trash and make up a significant part of the city’s underclass. Read about them in “Salvaging Dignity” from the September 2012 edition of ONE. For more than a millennium, Central Europe’s Carpatho-Rusyns have been engulfed in a violent whirl of Magyar, Germanic and Slavic antagonism. Always subjugated, Rusyn peasants toiled soil, kept livestock or cut timber for their Hungarian, Austrian or Polish masters. Such conditions, coupled with centuries of serfdom and forced assimilation, hardly favored the development of a distinct Rusyn identity. Nevertheless, among the Rusyns such an identity did develop, sowed by their distinct Slavic language, nurtured by their Byzantine Christianity — which they received from Sts. Cyril and Methodius in the late ninth century — and reinforced by their full communion with the church of Rome. Today, fewer than 900,000 Rusyn Greek Catholics are scattered throughout Croatia, the Czech Republic, Hungary, North America, Romania, Serbia, Slovakia and Ukraine. A unified church, gathering them all under one mantle, does not exist. Rusyn Greek Catholics — also called Ruthenians — make up three distinct churches that, while sharing the same origins, traditions and culture, remain independent of each other. In the United States, the Metropolitan Byzantine Archeparchy of Pittsburgh, with its three dependent eparchies of Parma, Passaic and Phoenix, is a particular or sui iuris church. It includes about 82,000 members. The Eparchy of Mukacevo in Subcarpathian Ukraine, which numbers about 320,000 people, is dependent directly on the Holy See. The Apostolic Exarchate for Byzantine Catholics in the Czech Republic is also dependent on the Holy See and counts 170,000 members. Rusyn Greek Catholics also belong to various jurisdictions of the Greek Catholic churches of Hungary, Romania, Slovakia, Ukraine and the former Yugoslavia. Complicating matters further, substantial numbers of Rusyns, all formerly Greek Catholic, have created communities within various Orthodox churches in North America, Poland and the Czech and Slovak republics. However, with the exception of the American Carpatho-Russian Orthodox Greek Catholic Church — an eparchy formed in Pittsburgh in 1939 under the jurisdiction of the ecumenical patriarchate in Constantinople — their Rusyn identity has largely eroded. While a unified church may not yet exist, European and North American Rusyn Greek Catholics work together, assisting one another with financial and human resources. This mutual support is not limited to the Greek Catholic community alone. Guided by the ecumenical movement and encouraged by the foundation of nonpartisan societies dedicated to the study of Carpatho-Rusyn genealogy, history, literature and religion, relations among Rusyns of all faiths press forward. Read a full account of the Carpatho-Rusyn Greek Catholic churches here. "They Are Ready to Face Any Challenge in Life"
Eighth-grader E. M. Ebin, a resident of the Malankara Boys’ Home, takes a break from studying. The home is steeped in Christian values and Catholic teaching. But as with much of Indian society, it dwells side by side with other faiths — literally. The home is located between two family homes, one Hindu the other, Muslim. D. Vijaya Kumaran, the Hindu neighbor, and Nazim Ibrahim, the Muslim neighbor, have been associated with the home from the beginning, with Mr. Kumaran’s two sons and Mr. Ibrahim serving as tutors for the boys. Mr. Kumaran, a retired bureaucrat, describes the Malankara Boys’ Home as “one of the best institutions in the area.” Mr. Ibrahim, a Kerala State Transport Corporation official, hails it as a “model” for those trying to help the poorest of the poor. Mr. Kumaran says he has seen an amazing transformation in the home’s children. “When they first arrive, they are timid and withdrawn,” he says, noting that such behavior is to some extent culturally instilled in people coming from backgrounds with lower social standing. “But by the time they leave, they are ready to face any challenge in life,” the 69-year-old upper-caste Hindu explains. He commends the home’s priests for giving individual attention to the children. 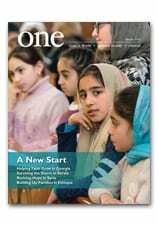 Read more about “Reaching the Young ‘Untouchables’” in the Summer 2013 edition of ONE. And to learn how you can support this project and so many others in India, please visit our giving page. Syrian residents inspect the damaged area after war-crafts belonging to the Syrian army bombed residential areas in Ein Tarma district in Damascus, Syria on 13 October 2015. This weekend, once again CNEWA will be hitting the road. As we did recently in Illinois, we’ll be visiting a parish in Altoona, Pennsylvania: St. John the Evangelist. I’ll be preaching at all the Masses and members of our development team will be on hand to meet parishioners, pass out information about our work and answer questions about how people can support our mission, particularly on behalf of refugees in the Middle East. And if you’d like CNEWA to visit your parish or church group, please just drop a line to our development director, Norma Intriago. nintriago@cnewa.org.